The annual chaos has hit the UK after a snowstorm has ground the country to a halt. According to The Daily Mail, at least 2,000 schools across Britain serving nearly a million children are shut. As the Met Office told motorists not to abandon their cars 100's of people have done just that and have abandoned their cars causing chaos on the roads. As expected buses and train journeys have been cancelled leaving many people stranded. In Devon and Cornwall, hundreds of motorists blocked roads after abandoning their vehicles following the arrival of 'snow bomb' - but the sea of cars, lorries and vans meant gritters and emergency vehicles failed to get through. On the A30 crossing Bodmin Moor, more than 100 people were stuck in their cars for ten hours. Some slept inside their vehicles while others made it to the famous Jamaica Inn pub where they spent the night on makeshift beds. The overnight lowest temperature was -15.4C (4.3F) in the Aberdeenshire village of Braemar - making it the coldest night in seven years, since the -15.6C (3.9F) observed on February 11, 2012, at Holbeach in Lincolnshire. Actually it was nothing, certainly compared to other dumps we've had in the past. 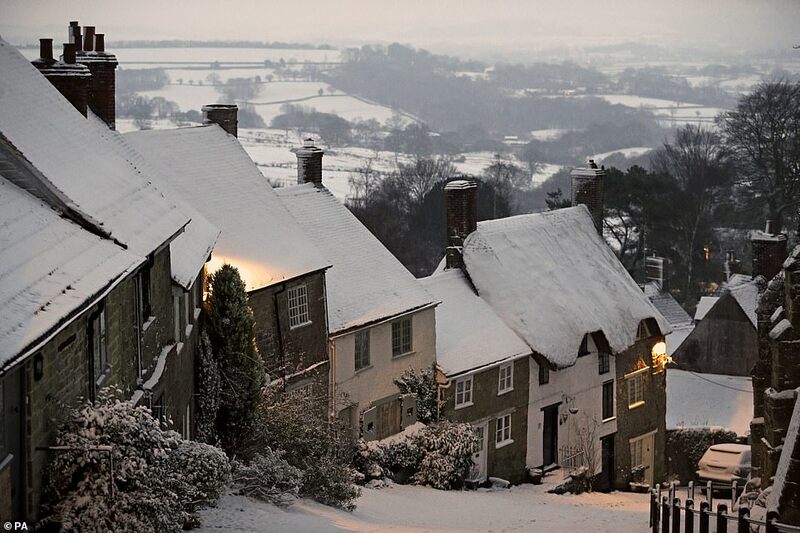 Your picture is of 'Gold Hill' in Shaftesbury, north Dorset. In 1963 I was living on a farm in nearby Gillingham. It started snowing on Boxing day and lasted for weeks. The farmers sons built a full sized igloo in the back garden and were living in it. The remnants of the igloo were still to be seen in June. No central heating in those days, we used to go and stand in the cow shed to keep warm ! Haha, I know, I was just a nipper then, seven years old, the year the Gulf-Stream stopped. Be thankful it is just snow. Over here across the pond, we've been at -30 to -60 windchill factors for much of the last week. It really played heck with the water pipes. Many died.